Hexnut, a contemporary quintet founded in 2003 by Ned McGowan, an American composer and flute-player, is based in Amsterdam. The name, short for "hexagonal nut", reflects McGowan's interest in industrial machines. The ensemble grew out of a composition workshop set up to experiment with unusual instrumentation, mixing sounds, playing techniques and styles such as contemporary classical music, jazz, rock, metal, avant-garde, improvisation and cartoon music. McGowan has contributed many pieces, such as Tools (another example of the industry theme), winner of the Henriette Bosmans Prize, and other commissioned work. The compositions that form the basis of Hexnut's sound vary in style from dramatic virtuosity and theatrical minimalism to experimentalism, from theatre sport to object theatre, all exploiting the talents of the individual players. Hexnut reflects McGowan's affinity for the edgy, risky and yet extremely precise - the embodiment of the brutal and humorous. A journalist praised him for being a "perfect example of the juxtaposition, assimilation and contradiction of styles within improvisation and composition" that McGowan is constantly reinventing. He is often seen in Hexnut behind his contrabass flute, which has become one of his specialties. "Hexnut doesn't need any guitars to rock, as the ingenious interpretation of one of Vai's guitar solos by the recorder-player demonstrated," said Daan de Vries in 3VOOR12 Tilburg, the local edition of the Dutch TV pop magazine in 2008. "This is wild stuff," added Anita Randolfi (American Recorder Magazine, September 2007). The ensemble is "totally bizarre, and equally wonderful," according to Hans van Lissum (Cut-Up.com, 2007). Hexnut consists of five highly gifted, eccentric musicians: Ned Mc Gowan (flute and contrabass flute), Susanna Borsch (recorders and electronics), Gijs Levelt (trumpet), Michaela Riener (vocals) and Ere Lievonen (piano). Ere Lievonen plays the harpsichord, piano, fortepiano and organ, and is also a composer. As a performer, he specializes both in historical performance and in contemporary music – especially on the harpsichord – and has played at many contemporary and early music festivals in various European countries and the USA. Born in 1972 in Oulu, Finland, he began his musical studies in his home town at an early age, and went on to study at the Sibelius Academy in Helsinki. He completed his studies in the Netherlands, where he has been living since 1997, and he has obtained degrees in organ and harpsichord playing, historical piano music, early music and contemporary music from the conservatories of Amsterdam, Utrecht and The Hague. Susanna Borsch is one of the few instrumentalists who is able to interpret both contemporary and early music with complete ease. She studied at the Amsterdam Conservatory under Walter van Hauwe, and took her final solo examination in 2000. Her first solo CD, issued in 2006 featured many new works for recorder and live electronics written especially for her. She plays in many different ensembles, including Mezzaluna, a recorder ensemble devoted to exploring the depths of 16th century renaissance vocal polyphony. Susanna also plays with Hexnut, and with ELECTRA, an all-female modern music ensemble combining the latest music with visual and theatrical elements. Composer and flutist Ned McGowan, who was born in the United States in 1970 and has been living in the Netherlands since 1994, founded Hexnut in 2004 and also founded the Axyz Ensemble. "Ned McGowan's music strives for an idiom in which various types of music - American popular, European classic, avant-garde and Carnatic - are combined with a fascination with proportionally intricate rhythms and the use of microtones," said musicologist Bob Gilmore. As a teenager Ned took classical flute lessons, played jazz and listened to rock. After finishing his studies in the flute at the San Francisco Conservatory and the Cleveland Institute of Music he moved to Amsterdam to continue his music education He took lessons from Anne La Berge for several years, learning works by Ferneyhough and Sciarrino, among others. Over the course of eight years, he studied both flute and composition in Amsterdam and The Hague, exploring a wide range of subjects - from extended techniques to Carnatic (Southern Indian) forms and rhythms, from jazz improvisation to West-African drumming. His compositional voice was profoundly influenced by these experiences. In 2007, he studied performance, rhythm and composition in India. Ned McGowan has performed in India and the USA (Carnegie Hall, where he played with the American Composers Orchestra), and in many other venues all over the world. The Austrian singer Michaela Riener is a dedicated advocate of contemporary music and works closely with composers. In 2006, she joined the well-known new music group ELECTRA, a virtuoso four member ensemble featuring violin, voice, percussion and recorder and combining the latest music with visual and theatrical elements. Like Ere Lievonen, Michaela specializes both in historical performance and in contemporary music. She gained her Master's degree in Early Music in 2010 from the Royal Conservatory in The Hague, where she studied under Jill Feldman, Gerda van Zelm, Michael Chance and Peter Kooij. She also graduated from the Bruckner Conservatory in Linz and spent six years at the University of music and the performing arts in Vienna. Her unbounded love of chamber music is reflected by the fact that she is currently singing in six or more ensembles. Trumpet player Gijs Levelt (born in 1973) studied under Charles Green at the Sweelinck Conservatory in Amsterdam. He has followed master classes from Bobby Shew, Jimmy Owens, Markus Stockhausen, Peter Masseurs and Carnatic singer Jahnavi Jayapraklash amongst others. Gijs has been associated with - and indeed founded - many different music groups, including the Wim Lammen/Gijs Levelt sextet (which he founded together with saxophonist Wim Lammen), and the jazz quartet Four Wheel Drive (also founded together with Wim Lammen, in 1995). In 1996 Gijs founded the Dutch Jazz Trio with singer FayClaassen and guitarist Vincent Koning. They toured all major cities in Japan for a month in the same year. One of Hexnut's best-known projects is WRENCH - another play on an industrial theme: a wrench or spanner is the tool used to tighten a hexnut. Wrench combines eight duets of music and photography inspired by photos by Edward Burtynsky and first performed in this project by Hexnut in a tightly orchestrated audiovisual format. Hexnut collaborated in this project with eight composers and with the world-famous Canadian photographer and artist Edward Burtynsky, who is perhaps chiefly known for his photographs of industrial ramifications which are featured in "Manufactured Landscapes", an award-winning documentary by Jennifer Baichwal (2007) on his work. The documentary was an entry in the World Cinema Documentary Competition held at the 2007 Sundance Film Festival in Utah, the largest independent film festival in the USA. The DVD of the documentary, which can be ordered from www.homescreen.nl and various distributors in other countries, is full of Burtynsky's mind-boggling images of man's impact on the global environment. The film is presented by Mercury Films/Foundry Films in co-production with the National Film Board of Canada, and in association with TVONTARIO. Images copyright Edward Burtynsky, courtesy Nicolas Metivier, Toronto & Flowers, London. A book by Burtynsky of the same title has a striking cover photo (see above) showing a bright red river. This is not a trick of the light or a retouched photograph, but a true representation of a river polluted by waste from a nickel refinery. The beauty of the image hides the appalling destruction of the environment caused by the pollution. Burtynsky saw this amazing sight in Canada and immediately took a photo of it. This was his first step in a 25-year career of "industrial photography", which would take him all over the world to explore unfamiliar places where human activity has reshaped the face of the land. WRENCH is a coupling of projections of Burtynsky's photographs with new musical pieces composed by David Dramm, Mayke Nas, Steve Ricks, Anthony Fiumara, Seung-Ah Oh, Jan Bas Bollen, Felipe Waller and Ned McGowan. The project started in 2011, and was an initiative of Ned McGowan. "WRENCH is a fusion of music and photography," he explained. "It combines photographs by Burtynsky and the music from renowned composers. I asked 7 composers to select one or more of Burtynsky's photos and to compose a piece of music to form a dialogue of image and music. I also composed one of the works, so there were eight pieces in total." The project was basically shaped by the composers round Burtynsky's photos. Ned McGowan (as reported by René van Peer in the Dutch regional daily Eindhovens Dagblad) commented, "When we came to play the pieces, something extraordinary happened. We didn't want to have images with musical accompaniment nor music with a slide show in the background, and the result was indeed a true duet between the images and the music. It is noteworthy that Anthony Fiumara's work is the only one that has a photo where people play a key role: endless rows of Chinese workers in enormous factories where our mobile phones are assembled, doing monotonous routine work all day long." Environment, pollution and the alienation caused by industrial production are the main themes of Burtynsky's work. His photographs remind us that oil fields, refineries and recycling plants do exist, even though not many of us see them on a daily basis. Ned McGowan was greatly impressed by Burtynsky's photos, right from the start. "I could talk for half an hour about each photo," he enthused. 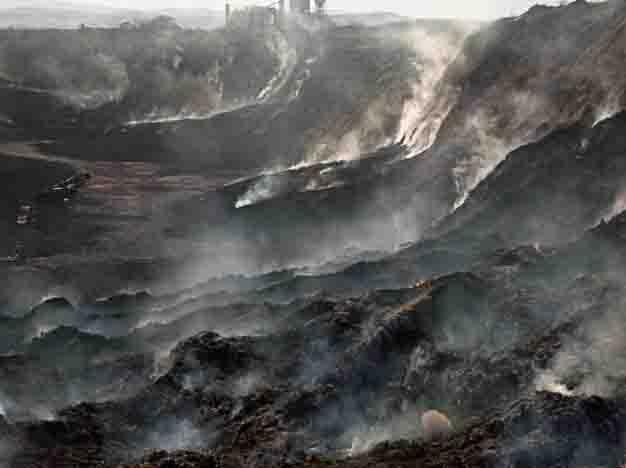 "I chose one that showed a huge pile of car tires being recycled in California. Recycling plays a big role in his photos, and that's a theme that interests me as a composer. Any musical piece contains a number of motifs that are repeated - you could say recycled - endlessly. I like to look at his photos from various perspectives. You may wonder what the emotional significance of a photo is. Some photos are so rich in detail that they are completely absorbing and as you gain more information from a photo by zooming in on details, it can become increasingly dramatic." McGowan emphasised ther ambivalent feelings he had from looking at Burtynsky's photos:"I am touched by their duality, and the incredible beauty and detail of the images. And by the message they convey, of how the earth is changing and being degraded by the all-pervasive industrial activities that are covering our planet on a gigantic scale." "It was a privilege to be able to use his photos, and we felt particularly honoured that he was present at the premiere of WRENCH in the Muziekgebouw aan 't IJ in Amsterdam. 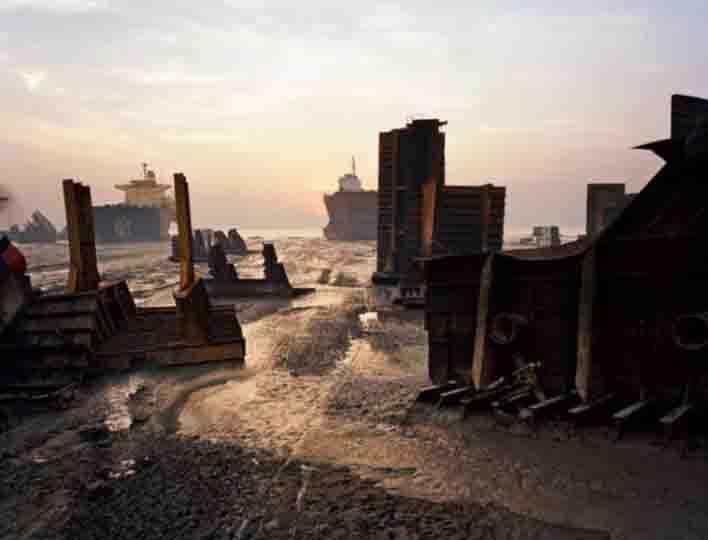 One of Burtynsky's most dramatic photos is "Shipbreaking" (see above), which shows the breaking up of a ship in Bangladesh and was projected during the piece by Felipe Waller. "Pentimento Ships" was a side project of "Shipbreaking". The photo shows enormous oil tankers beached in preparation for demolition. It looks like an abstract sculpture park, but the underlying reality is that we are looking at a graveyard of once useful seafaring vessels. The questions this image generates are fascinating. And in addition, the photo and others in its series remind us that many of the men working on these ships will have a short life expectancy because of the polluted environment in which they have to work." Burning Tire Pile, near Stockton, California, USA (1999). "If we destroy nature, we destroy ourselves." Internationally acclaimed for his large-scale photographs of "Manufactured Landscapes"- quarries, recycling yards, factories, mines and dams - Burtynsky creates stunningly beautiful art from civilization's materials and debris. The documentary by Jennifer Baichwal follows him through China, as he shot the evidence for the effects of that country's massive industrial revolution. Breath-taking sequences, such as the opening tracking shot through an almost endless factory, enable the filmmakers to extend the narratives of Burtynsky's photographs. Burtynsky won the prestigious awards for his book "Oil", in which he documents the epic story of the socio-economic effects of industrialisation. His work was on display in fifty leading museums around the world, including the Museum of Modern Art in New York, at that time. Burtynsky was obsessed by pollution, which gave each of his photos a dual nature with beauty on the outside covering an inner layer of degradation and destruction of man and the environment. Burtynsky simply records what most people would prefer to disregard nowadays: "We come from nature, we are connected to nature. If we destroy nature, we destroy ourselves. These images are meant as metaphors of the dilemma of our modern existence; they search for a dialogue between attraction and repulsion, seduction and fear. We are drawn by desire - a chance of making a good living - yet we are consciously or unconsciously aware that the world is suffering for our success. Our dependence on nature to provide the materials for our consumption and our concern for the health of our planet sets us into an uneasy contradiction." "Burtynsky documents the way the earth is changing through the progress of Man," said Ned Mc Gowan. "We may want a marble kitchen countertop, but the marble used for this purpose has to be quarried out of some once lovely hillside. Burtynsky has made magnificent photos of quarries where workers are hacking out huge pieces of rock, changing the contours of the land and resulting in enormous holes in the ground. His photos never show the work of vandalism in progress, just the horrendous but at the same time spectacular traces it leaves behind." "Oil. The black gold. Flows through tubes and pipes and pipes and curves and tubes and pipes before it leads to more tubes and pipes and pipes and curves and tubes and pipes," said Mayke Nas, one of the eight composers. Hexnut's bizarre flute sculpture, and the music composed by Mayke Nas for the WRENCH project, were both given the name Petrochemical Vibration Construction. The instrument was specially built for the WRENCH project by flute-maker Jelle Hogenhuis based on a idea by Mayke Nas. "The PVC assembly can be played like a set of flutes, but also looks like a scale model of part of an oil refinery," Jelle explained. "The eight instruments suspended in the network of pipes all have different lengths, from 1 to 5 metres, to allow them to generate widely differing notes. Overblowing can be used to produce 6 to 8 overtones in each case." 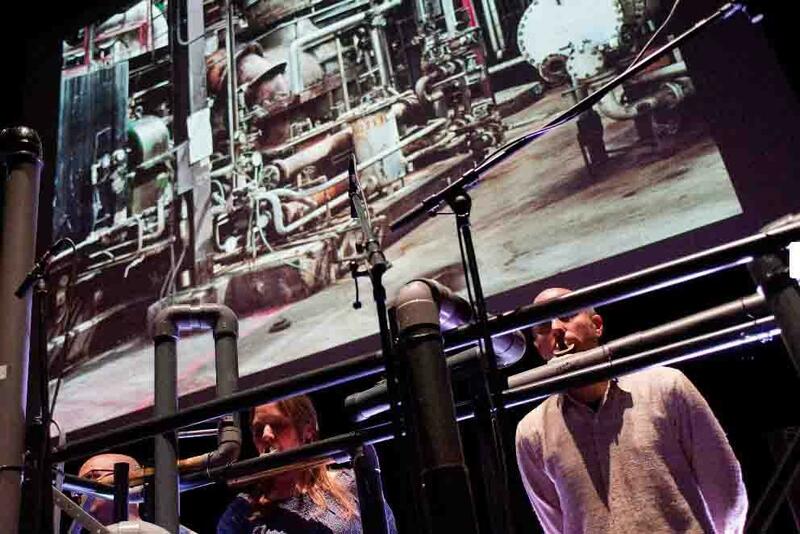 The Petrochemical Vibration Construction, which instructs five musicians to play music by Mayke Nas on eight flutes, is an impressive "music machine" played by Hexnut during a performance of WRENCH. Burtynsky's photos of oil refineries are projected on neighbouring screens (see below). Ned McGowan explained: "The work reflects oil: PVC flutes (made out of oil) and the refineries. The images and the music are linked and the work is a meditation on their connection." Mayke Nas (born 1972), who composed the music for the PVC construction enjoys creating music for musicians breathing simultaneously, for moving chairs, wired blackboards and bridges opening. She considers herself fortunate to be able to work with Nieuw Ensemble, Asko|Schönberg, Slagwerk Den Haag (Percussion The Hague) and the Royal Concertsgebouw Orchestra. She has been awarded an artist-in-residence fellowship in Berlin for the 2011-2012 season by the German Academic Exchange Service (DAAD). Mayke enjoyed working with Hexnut very much. She explained: "I selected a set of photos of oil refineries from the high-resolution photos Edward Burtynsky had made available for the project. They showed seemingly endless series of pipes, weaving through one another in a complex array - beautiful images, but terrifying at the same time because they reflect the enormous scale on which oil is produced and consumed, leading to huge problems for all of us and causing great harm to the environment. Beauty and the beast combined. I had the photos projected during the concert in such a way that one image gradually crossfaded into the next, making the complex array of pipes seem even more confusing. I tried to make the music reflect the impression created by the images as closely as possible. This led me to the idea of building a huge musical instrument that, like an oil refinery, consisted of a complicated network of pipes - literally made of oil as well: PVC, which is a petroleum product. Ned introduced me to Jelle Hogenhuis, who translated my idea into a splendid arrangement of pipes, looking just like a miniature industrial plant, in which the 8 instruments were integrated." For further information about Mayke Nas, visit the website: www.maykenas.nl. Internationally renowned flute-maker Jelle Hogenhuis initially studied building engineering, but turned to music after graduation. He studied classical flute at the Groningen Conservatory in the Netherlands under Peter van Munster and composition under Willem F. Bon. Jelle won the Dutch Composition Prize in 1980. Besides being a flute teacher, he has been a freelance player and composer. His works as a modern classical composer include pieces for small ensembles as well as some symphonic works and two short operas. 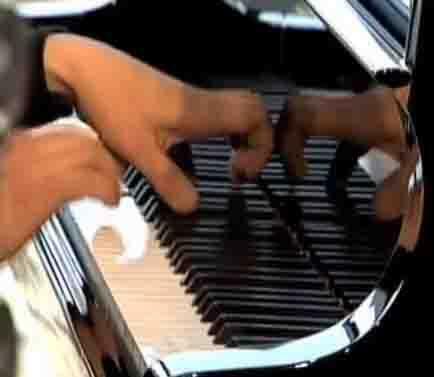 He sometimes composed and arranged pieces in jazz or pop style for this pupils. He belonged to the Groningen Flute Quartet for 10 years, and the experience he gained here was the basis of later developments. His position as the leader of large flute ensembles gave him ample opportunity to test newly developed flutes. Ensemble flutes demand a different approach from that used in orchestra flutes. Thanks to successful development of new techniques allowing flutes to play a much lower range of notes than traditional instruments, flute choirs from all over the world now have access to the same range as string ensembles. Jelle Hogenhuis looks back with pleasure on the construction of the flute installation for Hexnut, conceived by Mayke Nas. "I've worked a lot with Ned McGowan," he said. 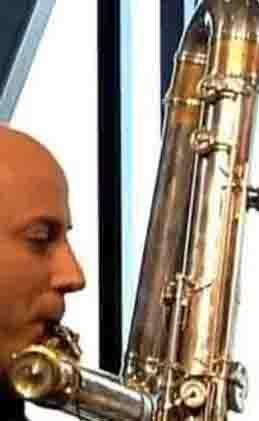 "The instrument he currently plays on is a customised contrabass flute I built for him. I made the tube construction - the hardware - for the WRENCH project. The basic construction is a sort of big square array of plastic pipes, in which eight playable pipes are inserted. They are really eight separate musical instruments, suspended in that big pipe array. There are not interconnected. The whole thing is made out of straight plastic pipes and bends. It's an ingenious construction, but not an extreme task for me with my 25 years' experience of flute-making. If you forget about the supporting structure, it's just eight different instruments. The whole thing was fun to build, and fun to play on. Hexnut has played on it in Utah in the USA, and it must be said that the shipping costs for getting the whole installation there were quite high. It took some time for the players to learn to play the instruments properly, because of the length of the pipes. The biggest instrument was given a sort or recorder mouthpiece, which made it quite easy to play. 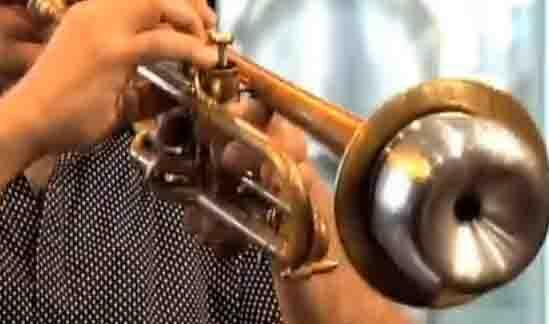 This was played by Hexnut's trumpeter. All he had to do was blow to produce a reasonable sound. The other instruments have a kind of flute mouthpiece, which does require a bit of technical control to play properly, but the musicians managed quite well. All in all, you could say it is a kind of primeval wind instrument." For further information about Jelle Hogenhuis, please E-mail: hogenhuisflutes@gmail.com. The music accompanying Burtynsky's photo "Pentimento Ships", composed by Felipe Waller, gave Hexnut's vocalist Michaela Riener the challenge of singing a song written in Bengali especially for this occasion. She has had experience of singing in many different languages, but Bengali was a new one for her. The lyrics were translated into English, but Michaela sang them in Bengali, in a mysterious voice. ("When I sing in a foreign language, I attach great importance to fully understanding the words)." Felipe Waller made a deliberate choice of the theme "shipbreaking". "My experience with Burtynsky's photographs is of an ongoing confrontation," he explained. "A space is created where unsolved questions tainted with beauty arise. I chose the shipbreaking scenario because ever since I moved to Holand, living in the ports has been a staggering encounter with the omnipresent shipbuilding and transport culture for me. In the piece "Pentimento Ships", the words and phrases in Bengali are evoked by the singer as a sort of medium, as a speaker. But for whom? Is it the ships being manifested as old worn-out rusty hulks, or is the shipbreaker's psyche begin revealed? Or is it perhaps the stranded spirits of the ship's former crews? Hexnut certainly has the tools to unearth some clues." Michaela Riener: "Our voice is a fantastic instrument". Michaela Riener aims to make her singing as authentic as possible. "That means in the first place that you have to move the audience. You can move people to be happy or sad, to dance with joy, but you can also shock them or frighten them, get them to feel things they had never consired before. It's a real challenge for me to shake people out of their day-to-day way of thinking. I am classically trained, but the kind of singing I do in Hexnut is different from the classical style. Hexnut demands expermental singing: you don't just sing words, but use your voice to produce a whole range of sounds: sometimes instrumental, sometimes like a singer in a band, sometimes like an animal or a machine. It all depends on what the composition demands. Our voice is a fantastic instrument, more so than any other instrument perhaps, and it can have a tremendous impact. I feel really lucky that I have been able to take part in WRENCH. Burtynsky's photos are something special. They're so beautiful, and yet each photo has a hidden meaning that can really grab you by the throat."